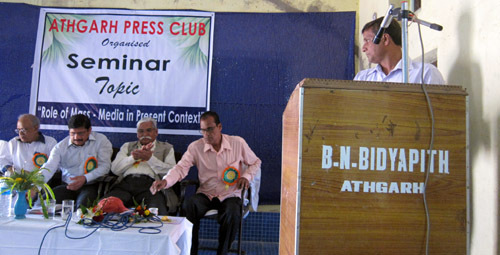 Mass media is changing into corporate-class media, which portends disaster for democracy, warned Prof. Biswaranjan while speaking on ‘Role of Mass media in present context’ in a seminar organized by Athgarh Press Club in the auditorium of B. N. Bidyapith, Athgarh on 25 November, 2012. Prof. Biswaranjan, a political scientist who till recently was the editor of Khabar, a vernacular broadsheet major, was the Chief Speaker. 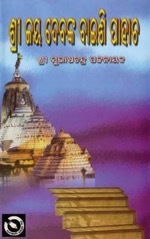 Mentioning of how the first attempt to share information with the society was made by a man of Athgarh late Sadhu Sundar Das through his unique depiction of news on sheets of bark of a plant called Bhurjapatra plant at Kujibara, Prof. Biswaranjan dwelt on contributions of media to the cause of the people, till it drifted away from the masses with the concept of market economy transforming its mission to profit motive. As an alternative, he said, neighborhood Medias with local low cost ads are evolving. Representative-in-Chief of ORISSA MATTERS, Subhas Chandra Pattanayak, as guest of honor, gave an elaborate picture of India’s present politico-economic condition in the pernicious hands of compradors in power. Expressing deep anguish over media in India increasingly becoming the rich man’s media, leading to loss of democratic prudence to mediacracy controlled by corporate houses, he called upon conscious journalists to expose the real picture of politicians that have pushed the country into ruins. He contextually mentioned of Orissa where official welfare programs are named after Biju Patnaik when the ruling party –Biju Janata Dal – is also named after him. This trick is so vote-catching that the fraction of BJD that opposes Chief Minister Naveen Patnaik, also brandishes Biju as its trade mark! This is the context in which media has a primordial role to play in order to save the State from the ruins, he observed. Diagnosing that Orissa is in ruins by politicians using Biju Patnaik as their mask, he said, unless media dismantles this mask, the State cannot be saved from the labyrinth of misrule. He, therefore, contextually dug out from the debates of the Parliament, how India had to suffer the ignominy of defeat in 1962 Chinese aggression because of the treachery he had played against the country, for sheer personal profit, through his Kalinga Airways. 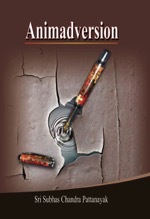 The degradation of the country has not developed in a day. Ever since independence, the politicians in power have individually and collectively contributed to its ruin. It is now time for the patriotic media persons to unmask the people in power, even if required posthumously, so that the people of the country can be saved from politico-economics disasters, he said. In the process, there shall be clash between the corporate owners of media organizations and the working media persons. But, as a class, the media persons must act, notwithstanding how that irritates the owners of their organizations. Victory shall be theirs and of the people; not of the corporate owners of media, he envisioned. Media trade-unionist Devi Prasanna Nayak, Sub-Editor of The Samaja, who heads the Association of its journalists and non-journalist employees, as a guest speaker said, burden of saving the people from repression, oppression and exploitation, has in every phase of the modern age been soldered by the journalists working under or with media houses. They must not falter in exposing the miscreants even if that embarrasses corporate media owners; because the people are of prime importance to journalists, not endearment with the operators. Bijay Ketan Mishra, Resident Editor of The Political and Business Daily, as the Chief Guest, lauded the Athgarh Journalists for having come up with the Press Club, which, he was sure, would promote cultural solidarity amongst the media persons active in the area. Earlier, before leaving for a welfare function elsewhere in the constituency, Athgarh MLA Ranendra Pratap Swain had welcomed the Press Club and lauded local journalists for having constantly acted as sentinels of public interest in the area. Focusing on evolution of different branches of journalism, he said that the responsibility of journalists has grown immensely in the present context of political and economic complexities. 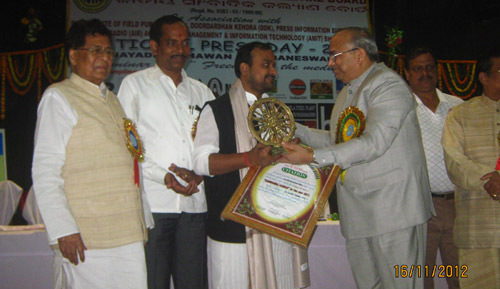 The Press Club President Sarbeswar Panda presided over the function. Dinesh Das, Secretary of the Club had introduced the guests as well as the subject. Besides members of the Club, socially active Advocates and writers of the area were also present in the function. Dismissing a misconceived suggestion that Manmohan Mishra was a panegyrist who eulogized Marx and Lenin, well known leftist intellectual and author Asish Mohapatra observed that the great revolutionary was a poet of the masses, who had immensely inspired the freedom fighters and the working class by writing and singing his songs for them in their own language and rhythm, while leading them in their struggles. It was very becoming of the poet to have eulogized Marx in some of his poems. Marx is the only one in the entire world and its history who has given the way for emancipation and, therefore, if Manmohan has praised him in his poems, there is nothing unusual in that, he roared. The poet’s 13th death anniversary was observed on November 19 with launching of a compilation of rare poems that he had written and sung, often instantly, while leading the masses in freedom struggle against the British and in post-independence mass struggles against maladministration, against official adoption of capitalist methods in nullification of the spirit of freedom struggle, against exploitation of the workers by industries, against misuse of State Exchequer for benefit of a few when the majority was being jostled into wretchedness, against treachery of politicians in power after independence. Dreams of freedom fighters for a People’s Republic having been lost in the labyrinth of capitalistic control over administration, Manmohan’s poems are of utmost relevance to guide the Republic into its track again, said the compiler. 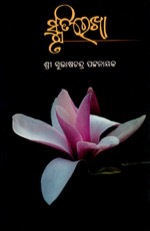 The compilation captioned ‘Kotikanthara Spandan: Manmohan’(Manmohan, the vibrating rhythm of millions of voices) is done by Mohapatra, a renowned Communist, who, himself being the nephew of Mishra, has prefixed his poems with a realistic critique on the poet and his works. 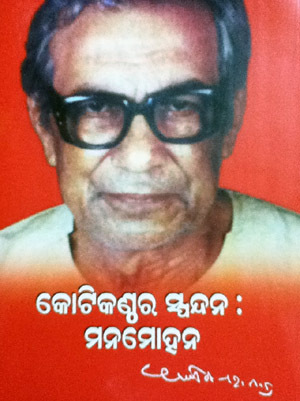 Mohapatra, a top leftist intellectual of the State, is well known for his books such as Itihasara Lohita Chakrabala (The Red Horizon of History), Sahityara Atma (The Soul of Literature), Mukti O Samatara Mahayoddha (The Great Warrior of Emancipation and Equality), Lal Tarakara Desh (The Land of Red Star), Viplav-Mukti Sangram O Ehara Mahanayak (Revolution – War of Emancipation and its Great Leader), Karl Marxnka Jibani (Biography of Karl Marx), to mention a few. He has interpreted Manmohan’s collected poems not only on the basis of close understanding he had with him as his nephew, but also as a Marxist scholar with expertise in interpreting the dialectics of revolution in poetic expression. Hence the book promises immense scope for study of the poetic stream of struggle for emancipation in this part of the globe. The book was released by Orissa’s famous progressive figure, former President of Bar Council of India, Advocate Jagannath Pattanaik. 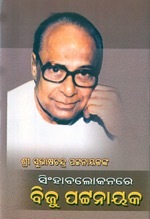 Citing samples of songs that Manmohan had written and sung often on various spots of mass action, Pattanaik recapitulated how his piercing oratory was injecting strength into the oppressed and the wretched with the electrifying effect of his songs, his poetic expressions. In the critical juncture where India has landed now, to whomsoever the people are important, Manmohan and his sufferings, and his sacrifices, and his poems would stay ever relevant sources of inspiration, he said. 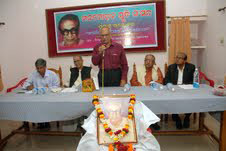 Utkal Prasanga editor Hussain Ravi Gandhi described Manmohan as the matchless leader of letters who had never deviated from writing for the people. Regretting that none of the national award winning poets of the State are with the people, Gandhi said, writing poems of the highest quality in the language of people perishing in the lowest layer of the society was Mnmohan’s specialty. Let the writers write against auctioning away the country to foreigners and that would be the befitting homage to Manmohan, he said. Another top leftist intellectual Prof. Laxminarayan Raysingh recalled many moments of mass action like the creation of Patia Bandha by the people that Manmohan had inspired by his lucid yet electrifying poems and incendiary oratory. CPI(M) leader and former MP Shivaji Pattanaik informed how the poet’s revolutionary anthology ‘Kotikanthe’(In the voice of millions) was banned by the government of Orissa after independence. He described Manmohan as a poet of the masses. 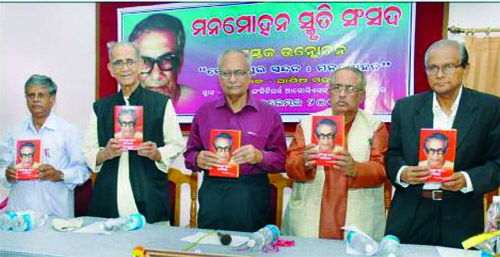 He was a part of the revolution of the people and was the voice of the people and therefore, was giving voice to his own poems, said Pattanaik. Giving many anecdotes from the life of Manmohan, he told the audience that the revolutionary poet was the leader of many battles against exploitation, starting from the days of the British imperialism to the post independence exploitation by traders and landlords. He was the leader of trade union movements. His writings were shaped by the struggle of the people. His first poem was on Madhubabu, the most revered and immortal leader of Orissa and his last poem was on Marx, he revealed. 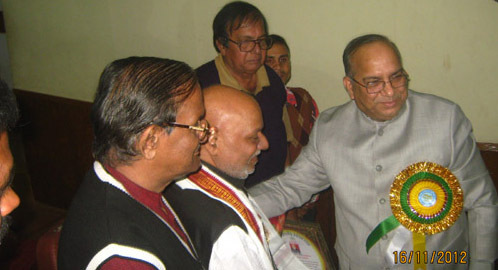 In his Presidential address, famous novelist Bibhuti Patnaik recalled how the Chief Minister’s wife Malati Choudhury had challenged the government of her husband Nabakrushna Choudhury, when Manmohan, the leader of mass uprise against curtailment of Orissa’s limbs – Sareikala and Kharasuan, constituting Singhbhum – in 1956 was thrown into the jail by the State Government. Patnaik, who himself was also arrested along with Manmohan, while leading the Students Union in the same movement, described the event as unique; because, despite being inseparably one with her husband in every mass movement before and after independence, Smt. Choudhury had taken over the reign of the movement in expression of solidarity with and protest against incarceration of Manmohan and his team by the government of her husband. This was how Manmohan was relevant to legendary revolutionaries of his time. 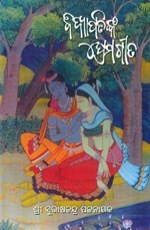 Santosh Das, the editor of Samyavadi, which has published the book, in his introductory address gave an account of how it was programmed by Manmohan Smruti Sansad and how meticulously Asish babu has compiled it. Suresh Panigrahi proposed the vote of thanks. 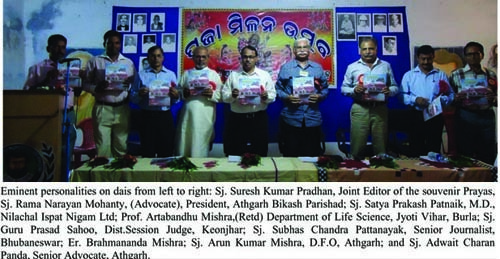 Amongst others, Prof. Bishwamohan Mishra, Rabi Dash, Dwarika Mohan Mishra, Janardan Pati, Prados Patnaik, Subhas Chandra Pattanayak, Sudhir Patnaik, Shanti Mishra, Dr. Seba Mohapatra, Pramod Mohanty, Asit Mohanty, Dr. Pramod Acharya, Ms. Puspa Das, Ms. Tapasi Praharaj, Baghambar Pattanayak were in the audience. 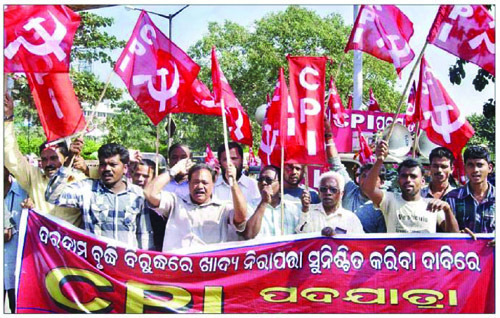 Bhubaneswar zonal unity of the Communist Party of India has strongly protested against transfer of shares of the successful public sector NALCO to private operators. In a rally, on November 19, it also condemned the central government’s irresponsible act of allowing FDI in multi-brand retails, as that would ruin India. When the country is crumbling in social sector due to blatant lack of food security, the government’s collaboration with capitalists in projects that shrink the agricultural coverage is making the situation worse for the people; the CPI leaders declared in a meeting presided over by the Zonal Committee secretary Sura Jena. The party’s national council member Ramakrushna Panda, Khurda District Council member Asok Sahu, Kailash Puhan, G. Govinda Deshra, Lingaraj Sahoo, Radhakant Satpathy and Sudhir Das addressed the rally. 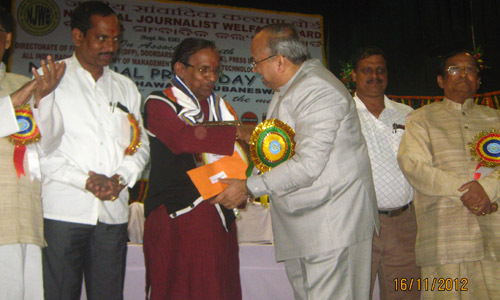 Freedom of Press should not be used to abuse any individual or institute in manners conducive to public mischief, advised Justice Anang Kumar Patnaik of the Supreme Court of India, while felicitating distinguished senior journalists at Bhubaneswar on 16 November 2012 at the behest of National Journalists Welfare Board, on the occasion of National Press Day. The Right to freedom of speech and expression enshrined in Art.19 (1) (a) of the Constitution is conditioned with reasonable restrictions and hence, the axiom of freedom of press generated by the Supreme Court of India out of the said Article should not be taken as absolute freedom, he said. Making a mention of Lord Leveson Commission constituted by UK to look into culture, practices and ethics of the media, which has given birth to broiling debates there, Justice Patnaik cautioned the journalists that if press in India is to stay free from any official formulation, they should adhere to the environment of self-regulation. Recapitulating how he was inspired by certain scribes of Orissa in his formative days, Justice Patnaik lauded the press persons for their contributions to India’s pre and post independence role in shaping up a better world to live in. Therefore to him it was a great pleasure to have an opportunity to felicitate some of the leading lights of journalism, he said. The event was supported by Central Government’s Press Information Bureau, Field Publicity Directorate, All India Radio – Cuttack, Door Darshan Kendra – Bhubaneswar and Amit College of Journalism. 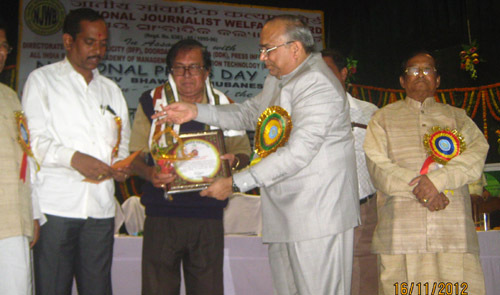 Eminent author and Editor of Samaya, Satakadi Hota was felicitated with ‘Sambadik Ratna’ award even as ten distinguished senior journalists of Orissa were felicitated with accompanying pension organized by NJWB, which is considered first of its kind in India. Four Journalists from outside Orissa – Santos Pande, Deepak Kumar Rath, Punit Nanda, and A. Santosh – were also felicitated with Sambadika Gaurav decorations. Rajyasabha member Baishnav Parida announced allocation of funds for a well equipped Ambulance to be used for journalists under medical exigencies, which the concerned officials would draw from his MPLAD accounts. Minister S. N. Patra, Minister Arun Sahu, Mayor Anant Narayan Jena, local MLA Bijay Kumar Mohanty, besides Sri Parida addressed the event that was preceded by a symposium on Freedom of Press in the forenoon. Ms. Shanti Snigdha Mohapatra was felicitated with Rabi Mohanty Memorial Shield for having achieved the first position in Journalism under the Utkal University. The event was presided over by journalist Pradosh Pattanaik. NJWB General Secretary Sanat Mishra coordinated the function and Vice-President Pradyumna Mohanty proposed the vote of thanks. On behalf of the state department of Culture and Door Darshan Kendra Bhubaneswar, eminent music director Basudev Rath and Bikash Das conducted a grand program of entertainment in honor of the Press Day. India’s famous NGO, the Servants of the People Society (SoPS) is in a quagmire of criminal activities. A gang headed by one of its former presidents – Manubhai Patel – has allegedly grabbed it in violation of its constitution and has resorted to criminal breach of trust, embezzlement and many such felonies. Known authority of SoPS Prof. K. C. Tripathy has raised the issue in the appropriate judicial forum; but the gang has not yet been able to establish its legitimacy. 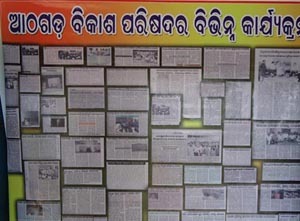 It is misusing the media power of Orissa’s popular daily The Samaja, which is under its illegal occupation, to browbeat the State officials to the extent of obliteration of records in police stations. One such instance is missing of Tripathy’s original FIR in the Khuntuni P.S. in the district of Cuttack despite receipts granted against the same. Tripathy had filed the FIR on 12 September 2012 and was sure of action against the serious offenses that he had pointed out with more then 200 pages of supportive documentary evidence. But, the entire bunch of documents along with the FIR was obliterated from the P.S. records. The OIC, who obliterated the records even after having giving the receipt, has, in the mean time, been transferred, probably with the help of the manipulators, as going away from the P.S. was clearly in his and the gang’s interest. The new OIC has, therefore, on 17 November 2012, obtained a copy of the FIR from the District Police Office, where it was available, as the complainant had forwarded the same to the Superintendent of Police (S.P.) seeking his intervention in the matter. And, with this copy of the FIR obtained from the S.P. office, the new OIC of Khuntuni P.S. has registered a case under section 420/34 IPC against Manubhai Patel and his gang comprising Niranjan Rath, Pravash Acharya, Bhimsen, Deepak Malviya, Raj Kumar, Ms. R. Sahoo and others. This particular FIR is lodged on felonies resorted to in the matter of Gopabandhu Institute of Medical Science and Research (GIMSAR) founded in Madhapur of Athgarh and funded by the SoPS from the income of The Samaja. The FIR alleges that “Niranjan Rath, Manu Bhai and their other associates presented wrong facts to the society (SoPS) about the operation of GIMSAR and dishonestly got money transferred to GIMSAR accounts for operational expenditure and salaries of the doctors and staff. The direct and indirect expenditure during the period mentioned amount to much over 3 crores ……..Major portion of the operational expenses and salaries claimed from the society through the Samaja accounts has been embezzled, siphoned off and fraudulently claimed and withdrawn”. This is a serious offense in view of the informed fact that “Niranjan Rath (had) hired staff and patients only for the days of inspection by the Government of Orissa and Ministry of Health Affairs to present that the Hospital was functioning with the required staff, equipments and facilities. Hired patients, who were paid, were kept in the Hospital to show the Hospital as functional”. 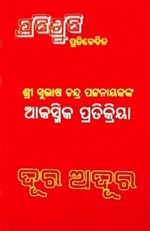 “Against the approved strength of the lecturers, professors, teachers and staff (as required for running a nursing institution and the hospital that being an institute of medical science and research) Niranjan Rath and his committee members namely Ms. R. Sahoo, Peravash Acharya, Bhimsen, and Deepak Malviya claimed money from Society’s Samaja account; whereas, in fact, there were no such lecturers, professors, teachers and staff ever appointed”, the SoPS authority has informed the Police. Prof. Tripathy has further informed, “Month after month Niranjan also claimed salaries in cash from the Society’s Samaja account in the name of paying salaries to execute the criminal conspiracy with the ex-general manager Hemanta Sahoo, the present g.m. of Samaja Suresh Mantry and other committee members including Ms. R.Sahoo (Principal, GIMSAR), Pravash Acharya, Bhimsen and Deepak Malviya”. On being informed by Prof. Tripathy and the Chief Executive Officer hemant Goswami of these dirty deeds, President of SoPS Omkar Chand had written to “all members and the trustees of the society for conducting an inquiry against Niranjan Rath. He had instructed the Treasurer to go to the spot and “physically inspect all the works and expenditures of GIMSAR”. But, the treasurer Deepak malviya “never did so”, the FIR has informed. 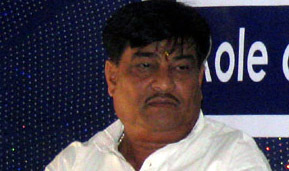 As the two top authorities of SoPS – Omkar Chand and Tripathy – appeared very disadvantageous to the miscreants, “Niranjan Rath acting with Bhimsen, Deepak Malviya, Raj Kumar, and manu Bhai started an underground design” against the two authorities “to remove them from their way” in order to escape disciplinary action and in “executing their plans”, they together “fabricated, forged and manipulated the Society minutes of April 24 and 25, 2012 and wrongly claimed that a meeting was held on June 27/28, 2012 wherein Hemant Goswami, Omkar chand and Tripathy have been removed and Manu Bhai has been made the President and Niranjan as overall in-charge of Orissa”. And, “thereafter Niranjan acting along with Ms. R. Sahoo, Pravash Acharya, Bhimsen, Deepak Malviya, Raj Kumar and Manu Bhai took forcible control of all documents and material of the society and destroyed many vouchers and other evidence pointing towards the crime. Many important files have been burnt by Bhimsen and Niranjan Rath and they have also removed many incriminating documents from the Chairman’s chamber by breaking its lock”, Prof. Tripathy has alleged in his FIR. The predecessor of the present OIC of Khuntuni P.S. had obliterated the FIR containing all these and much more allegations. However, the incumbent OIC has taken cognizance of the matter after obtaining a copy of the FIR, as noted supra, from the S.P. office. But Police conduct on allegations against this gang in another P.S. i.e. Cantonment Police Station of Cuttack City has sort of similarity with the misconduct of the former OIC of Khuntuni P.S. On July 5, 2012, Prof. Tripathy’s FIR against nine persons: (1) Manubhai Patel (2) Niranjan Rath (3) Bheemsen Yadav (4) Deepak Malviya (5) Raj Kumar (6) Kirti Bhai (7) Khem Chand (8) Suresh Mantry and (9) Priyavrata Mohanty; and others “not known at present” who have conspired, aided and helped in commission of the offense, was taken into cognizance by the Cantonment P.S. for the penal offenses attracting Section(s) 120-B, 403, 409, 416, 418, 420, 424, 427, 452, 465, 468, 469 of the Indian Penal Code and other provisions as applicable (and for which description is also provided in Sections 23, 24, 25, 26, 28, 29, 43, 44, 120-A, 405, 415, 441, 463, etc. of I.P.C.). But the Police, having taken cognizance leading to registration of a case against the alleged miscreants has slept over the issue, even though the miscreants have withdrawn the case they had instituted in Orissa High Court for quashing of the FIR. Has the Cantonment Police been corrupted by the miscreants like the former OIC of Khuntuni P.S. is a question that needs an answer from the Police Commissioner as it is he who was first addressed in the FIR filed by the known authority of SoPS. 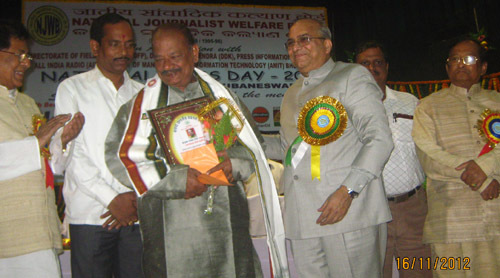 I was in a dilemma, because of personal reservation, when a registered body of Orissan Journalists styled National Journalists Welfare Board invited me to accept a pension it is to introduce on International Press Day, 2012 in recognition of lifelong contribution to journalism. The NJWB is neither recognized by any national organization of journalists nor has any official status to grant any senior journalist any pension. Within the prevalent frame of journalists’ welfare, its signature is not authentic on the basis of any law relevant to the journalists. This was the cause of dilemma. I consulted my friend Prasanta Patnaik and other senior journalists. The State government has a ‘Working Journalists’ Welfare Fund’. When I was the Secretary of Orissa Union of Journalists, on demands of OUJ, the then Information Minister Sarat Kumar Kar had constituted this fund. As the matter hit the proposed agenda before the Cabinet, the Law Minister – himself a lawyer – took the cue and a ‘Welfare Fund’ for the lawyers was immediately put on the anvil. The later took the shape of a law whereas the former got the shape of an executive resolution. Both the journalists and the lawyers are professionals in genre and serve the two pillars of democracy – the Press and the Judiciary – respectively, to set right the direction of democracy often derailed by the other two pillars – Legislative and Executive. These two pillars – Legislative and Executive – that often derail democracy, are well fueled with pension provisions.But the real propellers of the rest two pillars that save democracy from derailment are left to their fates in our system. Hence, it was essential to have state funding for welfare funds for both the journalists and the lawyers. But, sadly, Orissa Government discriminated between the journalists and the lawyers in the constitution of their respective Welfare Funds. And, consequently, the Working Journalists Welfare Fund is lying defunct. With the Trade Unions of journalists gone haywire under corporate conspiracies, in course of time, Media Unity for Freedom of Press (MUFP), which is the latest evolution of media brotherhood beyond the boundaries of Trade Unions in Orissa, has been stressing upon activation of the State Fund for journalists through radical amendment of the Working Journalists Welfare Fund Rules to the extent of encompassing both the employed and self-employed media persons, while giving it a regular status of Law with a regular flow to its corpus from revenue of the media houses that fetch advertisements from Orissa, with matching Grants from the State. But, the Government is not for the welfare of the journalists. Within the last one year, the MUFP has organized funds for treatment of journalists hospitalized for metabolic diseases and for traumas caused by police atrocities, corporate assaults, attacks by exposed criminals and on-duty accidents. Rajat Dash, Sub-Editor, Suryaprava; Jagannath Bastia, Puri Correspondent of The Samaja; Laxmidhar Mohapatra, Camera person of MBC TV; C.Ratnam, Paralakhemundi representative of EENADU are beneficiaries of MUFP contributions. 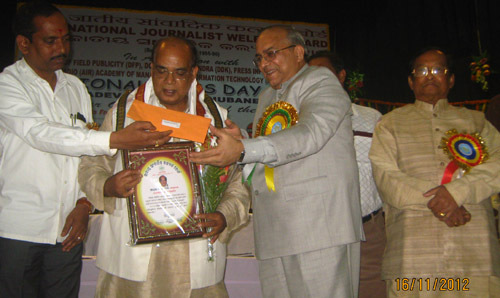 Whereas its contributions, though of immense timely help to Pabitra Mohan Khuntia, Vidual Editor of STV and senior Journalist of OTV Pitabas Panda could not save their lives, MUFP derived utmost satisfaction from having organized life saving funds for Ansh, son of Kanak TV Vidual Editor Sudarshan Palai. 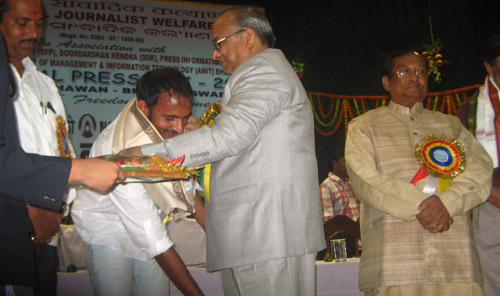 Though the Chief Minister’s Relief Fund was invoked by MUFP presidium leader Prasanta Patnaik for Ansh to a limited extent, it was deeply felt that it could have been better if the State Fund for Working Journalists could have been functional with expanded scope and adequate provisions, in all the above cases. We have tried our best to educate the Government in this regard; but in vain. Against this backdrop, even though NJWB is not nationally or officially recognized, its perseverance to fill up the gap, despite initial reservations in the world of Orissan media, seems to be an eye-opener endeavor to which media persons, adherent to journalistic norms, may not have any abhorrence. Therefore, I decide to accept the offer as a symbol of my appreciation for attempts of our younger friends, who through their perseverance have shown the Government that the journalists by their own endeavor can promote welfare provisions for members of their fraternity. One may hope that the NJWB action would wake up the Government to the occasion and make it conscious of its basic responsibility towards the sentinels of democracy. During the Puja celebrations, Athgarh Vikash Parisad, a noted pressure group of Athgarh, had a special interaction of its members with eminent persons of the area that usually reside outside. 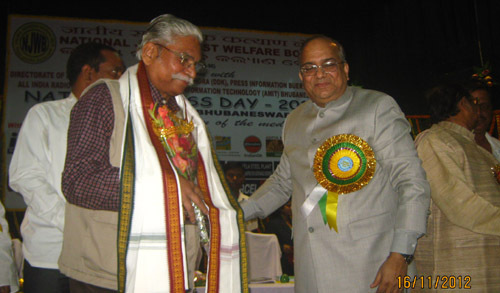 With Prof. Artabandhu Mishra in the chair, Chief Guest Subhas Chandra Pattanayak reminded the people of Athgarh of their lost District that was created after merger of the four sister Garjat States: Athgarh, Tigiria, Baramba and Narasinghpur with the province of Orissa in 1948; and called upon them to put top priority on its revival, as the District status would ensure flow of necessary funds from the State and Central pool for development of the four ex-States. He called upon the people to revolt against the discrimination they have been subjected to, as all the ex-States like Nayagarh that were formed into Districts after the State merger, but subsequently dismantled, have got back their district status, except the four States that had then comprised the Narasinghpur District. He and Guest of Honor Satya Prakash Patnaik, the Managing Director of the Nilachal Ispat Nigam Ltd unveiled Prayas, the souvenir brought out on the occasion. Decision to march ahead with corresponding commitment to the decision would help to have the target fulfilled, said Satya Prakash, who hails from Khuntukata, a village near Athgarh town. All the guests on the dais recalled the glorious past of Athgarh when she was a center of culture-tourism attracting people from all over India to not only Dhabaleswar, but also to various shrines and landscapes spangling the entire State. They recalled also the contributions Athgarh had made to India’s freedom struggle through leaders like Radhanath Rath, Braja Kishore Pattanayak, Lingaraj Jena, Govind Chandra Mishra, Duryodhan Jena, Achyutanand Dash, Arjun Sahani, Gopal Chandra Sahani, Ksetrabasi Subuddhi, Anant Charan Beura, Bairagi Charan Pratihari, Ramachandra Sahu, Chakradhar Behera, and Nanda Kishore Pattanayak et al. In his presidential speech, Prof. Mishra juxtaposed ‘Bipulashcha Prithvi’ (unfathomable earth) with ‘Bahulashcha Vidya’ (infinite knowledge) counting on matching correlation between resources and needs under the vexing canopy of survival and development. Parisad advisor Adwait Charan Panda, in introducing the event, had focused on the necessity of unity of the people amidst socio-political diversity in order to achieve common goals for development of the area. Parisad President Ramnarayan Mohanty’s excellent coordination and the local artists’ singing glory to Athgarh made the event real grand. In the audience, eminent persons like Dr Durga Charan Mohanty, President, Budhijibi Sangha Athgarh; Sj. Pranakrushna Das, President, Bar Association, Athgarh; Sj. Pratap Rudra Beuray, Eminent Social Worker; Dr Rajib Mohapatra, G.M., Balasore Ferro Alloys; Dr Durga Prasad Misra, G.M., Nilachal Ispat Nigam Limited; Sj. Swadhin Panda, Security Officer, Nilachal Ispat Nigam Limited; Sj. Pradwait Mishra, Senior Manager; Sj. 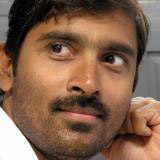 Narendra Bar, Director, Culture, Govt. of India; Sj. Narasingh ayak, Retd. D.I. ; Sj. 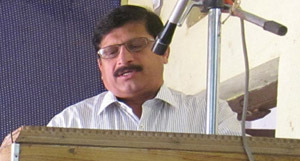 Kiran Bihari Khatua, President Dhabaleswar Seba Sanstha; Sj. 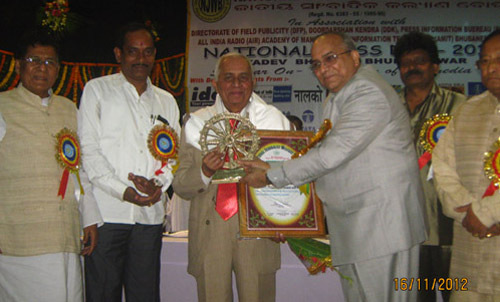 Pradipta Kumar Jena, S.D.P.O., Athgarh; Prof. Jatin Nayak of English, Utkal University; Er Bimal Mishra; Sj. Jagadananda Tripathy, Secretary, Bar Association, Athgarh; Sj. 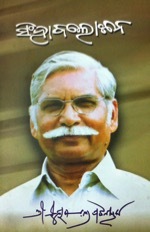 Bibhuti Bhusan Mishra, Senior Congress Leader; Sj. 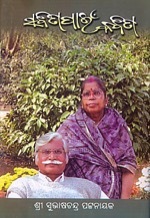 Bikram Das, Senior BJP Leader; Mrs Pravat Nalini Patra, Retd Teacher; Sj. 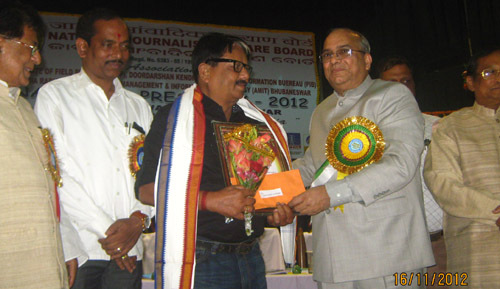 Sudhi Ranjan Dash, Reporter, The Samaj; and Sj. 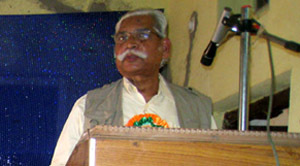 Chitta Ranjan Das, Retd. Judicial Officer were conspicuous by their presence.